Scenario: You're promoting an offer that has a daily cap, network wide. When the offer reaches its maximum cap, the network automatically redirects to another offer that you can't or don't want to promote for a reason or another. Is it possible to automatically redirect to an offer of your choice when the network switches to that other offer? Answer: of course you can do that with FunnelFlux and its PHP Nodes! The solution is to use a PHP Node before redirecting to offer 1, to check its page content. If some words are there on the page, then all is good and you can link to it. Otherwise, branch to another offer of your choice! If some specific content is found on the page, redirect to offer 1. Otherwise redirect to offer 2. 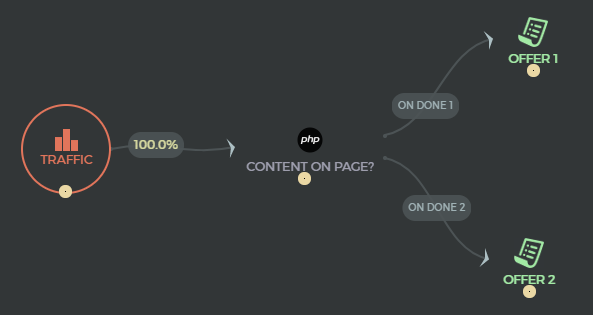 That makes this PHP Node check for the content of one specific offer page. It's not very flexible if you want to use that in different funnels, for different offers. To make it more flexible, you may want to use the custom tokens feature in your funnels. You can now use this same PHP Node in different funnels, for different offers. Unfortunately, a lot of networks will geo-redirect users to random pages when they don't match the offer criteria. There's two ways to approach this. Ask your affiliate network if there is a parameter you can add to turn this off. Sometimes you can add e.g. test=true or preview=1 to your links to have them go direct to the offer in preview mode. This can work. Change the above approach to use cURL instead, and route the request through a VPN server for the appropriate country (a bit more work!). For #2, check out this article for some guidance. We don't yet have example code for doing this, and it will vary per provider, but we'll come up with something in the near future that uses something like VyprVPN.